, a surgeon and famous herbalist of the time of queen Elizabeth, was born at Namptwich, Cheshire, in 1545. He practised surgery in London, and rose to eminence in that profession. 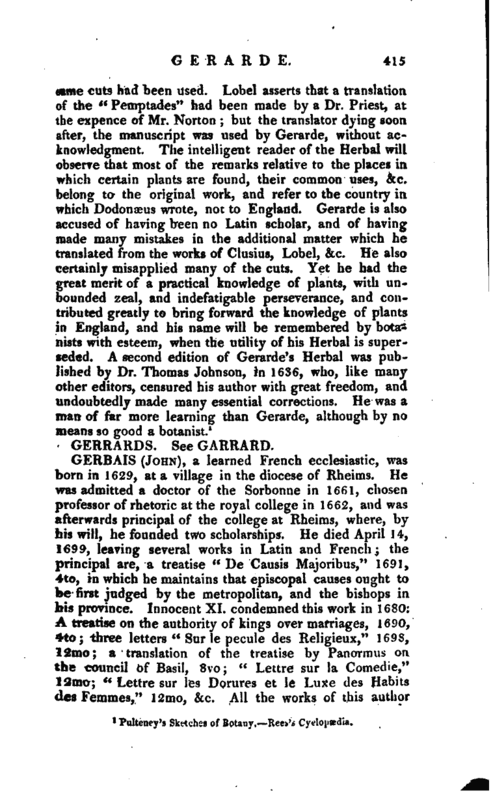 Mr. Granger says, “he was many years retained as chief gardener to lord Burleigh, who was himself a great lover of plants, and had the best collection of any nobleman in the kingdom; among these were many exotics, introduced by Gerarde.” This is conh’rmed by the dedication of the first edition of his Herbal, in 1597, to that illustrious nobleman, in which he says he had “that way employed his principal study, and almost all his time,” then for twenty years. It appears therefore that he had given up his original profession. Johnson, the editor of his second edition, says, “he lived some ten years after the publishing of this work, and died about 1607;” so that he survived his noble patron nine years. 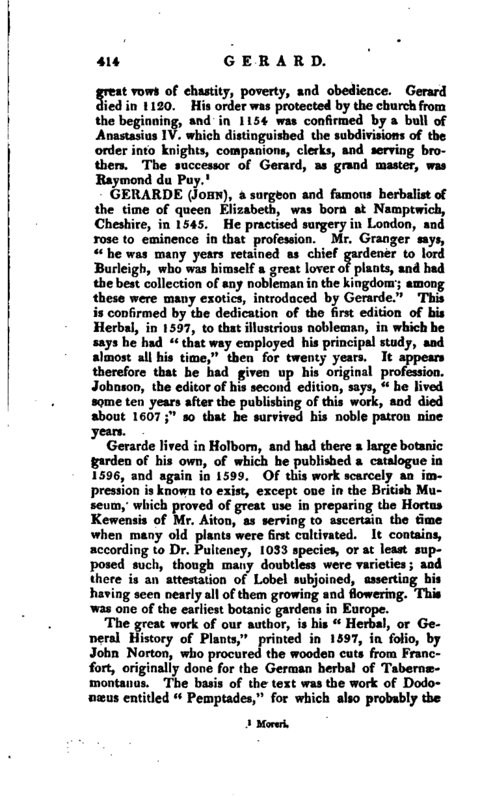 Gerarde lived in Holborn, and had there a large botanic garden of his own, of which he published a catalogue in 1596, and again in 1599. Of this work scarcely an impression is known to exist, except one in the British Museum, which proved of great use in preparing the Hortus Kewensis of Mr. Aiton, as serving to ascertain the time when many old plants were first cultivated. It contains, according to Dr. Pulteney, 1033 species, or at least supposed such, though many doubtless were varieties; and there is an attestation of Lobel subjoined, asserting his having seen nearly all 6f them growing and flowering. This was one of the earliest botanic gardens in Europe. Putteney’s Sketches of Botany.—Rees’s Cyclopædia.